For quite awhile, we have been using a teething tea that has proven very safe and effective. It’s our best remedy for teething! My 22-month-old gets a cup or two of the tea — he loves it — and drinks it in the evenings. It seems to completely relieve his pain, and he drools less, bites less, and sleeps much better. That last one isn’t a problem for us, but it’s one I’ve heard from others. The portability issue? If we only need it at night, we can take a bag of the tea mix and make it wherever we find ourselves. If that weren’t enough and we needed to be able to give it “as needed” during daytime outings, it would be tricky to make and carry it. Plus, many babies start teething at 4 – 6 months, before they are really eating solids, and they can’t simply sip a cup of tea. Many don’t even use a sippy cup (and I don’t recommend much liquid at that age, anyway — they need to be mostly having breast milk or formula). What to do about this? I make a tincture, instead. A tincture involves basically the same ingredients as a tea, except it includes vegetable glycerin as an extractor and (natural) preservative. It’s also much more concentrated, so smaller doses are needed. Place the herbs in a glass jar. Shake this mixture, cover it, and set it in a cool, dark place for about 6 weeks. Strain it out and keep it in glass. In a perfect world, brown glass. A small glass vial of it could go in a diaper bag or purse if needed on the go. The dose is about 1 – 2 drops to start. Work up a drop at a time as needed. There’s nothing toxic about this combination; even if the baby drank the entire jar it wouldn’t hurt him/her. But only a few drops should be needed. I’ll be making a batch of this soon to use with Nathan when he gets to teething age. He’s three months old now…where has the time gone?! Like the idea of a teething tincture but not ready to make your own? Let us make it for you! Try out Earthley’s Teeth Tamer. What’s your favorite teething remedy? Is this for consuming or a topical? This is for consumption — I offer a small amount in a cup or on a spoon to the baby. Where can I get the glycerin? We live in a tiny not whole-food friendly town. Try Amazon or Azure Standard or Mountain Rose Herbs. Does it have to sit for 6 weeks? Can you use it immediately? If you need immediate help, make a tea out of it instead. You can lightly sweeten with honey or maple syrup, or not — use a teaspoon for a smaller baby and toddlers can simply have a cup to drink. We used it starting at 4 mo. with our babies. Do you use the leaf & flower of the catnip plant? Mix 4 – 5 cloves with about 1 tsp. catnip, boil in 1 c. water. Strain it out and add a little honey to taste. I see chamomile in the picture but not in the recipe, do you use it for this? 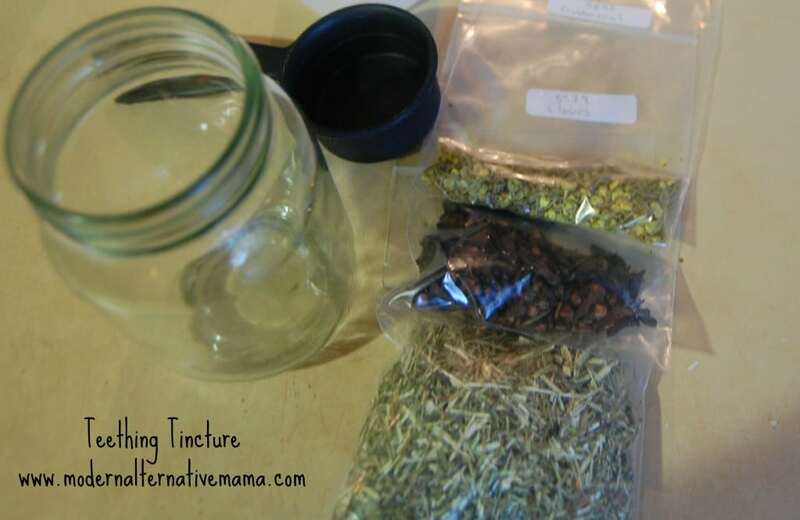 Is the tincture topical or for drinking? My baby is 10 months. It is for drinking, but you only need a tiny dose. I’ve been using 1/4 – 1/2 tsp. for baby since around 4 months (he’s 9 mo now). Can I make bigger batches of this to give some to my sister? That is to say, if I increase the recipe for say two bottles, would the concentration be higher? Can I use penny royal in place of the catnip? I don’t have access to catnip where I live. I’m not familiar with penny royal. Skullcap would work, or perhaps lemon balm. You can make it in 2 – 3 days. If you put the jar (all ingredients in it) in a crockpot filled with water (as high as the neck of the jar) and turn it on warm, leave for 2 – 3 days, and it’s done! Can I use Clove essential oil instead of cloves? If yes…how many drops would I use? Where do you store this when finished and how l long does it keep for? Thanks! I keep it in the cupboard (I have a medicine cabinet in the kitchen) and it will be good for about a year. Is it safe to add chamomile and possibly fennel to this? How much would you use? Thanks! I’ve just seen that this recipe calls for 1/4 of the amount of cloves that you recommend in your book (Mama and baby herbal wisdom). Why is that?